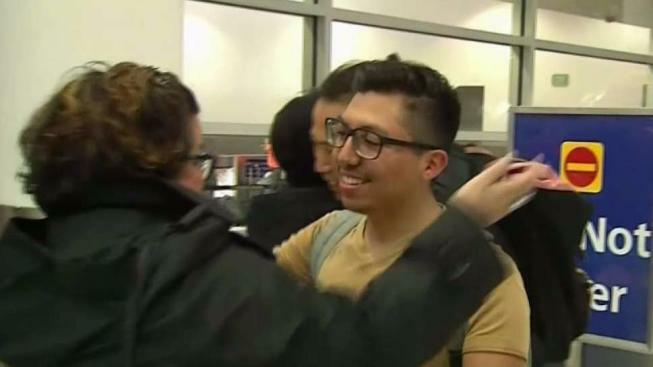 A UC Berkeley student held by immigration authorities in San Diego and released Wednesday arrived back in the Bay Area on Sunday. Luis Mora, a 20-year-old Cal junior born in Colombia, arrived at Oakland International Airport on Sunday evening and was greeted by a raucous group of supporters. "I'm just looking forward to continuing my college education and showing what we Dreamers are made of," Mora said. Mora was detained Dec. 30. after he and his girlfriend made a wrong turn and drove into an immigration checkpoint in the San Diego area. He had been in Chula Vista visiting his girlfriend over the Christmas holiday. Checkpoint officials asked the two if they were U.S. citizens, and Mora told them he was undocumented. Mora came to the United States on a visa in 2009 when he was 11 years old, disqualifying him from protection under the Deferred Action for Childhood Arrivals program, or DACA, which requires the person in question to have been living in the U.S. since June 15, 2007. He requested a hearing after being detained so that he could continue his education at Cal, where he studies pre-law political science. Mora's lawyer Prerna Lal posted a $1,500 bond for his release Wednesday. Though released, Mora still faces deportation. U.S. Immigration and Customs Enforcement issued the following statement regarding Mora's release: "ICE will transfer his case to the ICE Enforcement and Removal Operations office in the area where he resides. His removal proceedings remain ongoing. The immigration judge with the executive office for Immigration Review will determine the final outcome of his case." Lal said it could take a year for Mora's case to be transferred to the Bay Area and for him to have his first hearing. In the meantime, Lal hopes to work with Mora and set him on a path toward citizenship. After his release, Mora shared his appreciation for all those who supported him even though they had never met and extended the same appreciation to those critical of his presence in the country. NBC San Diego contributed to this report.